Snow? Ice? I’ll Have Another Hot Toddy! 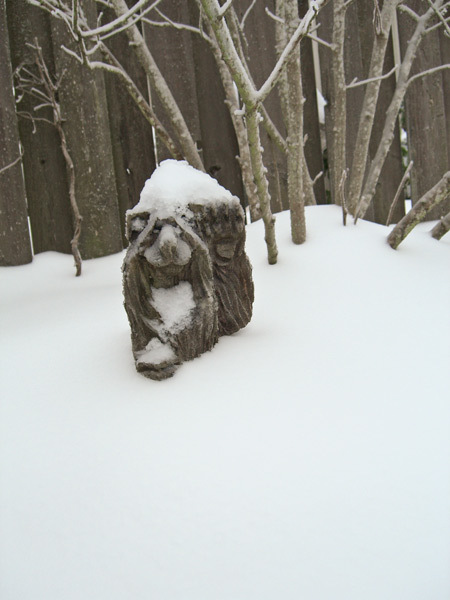 Brrrrrr… I know I said that you probably know what snow looks like, gentle reader, but last night the snow turned to freezing rain. What I have in my yard now is an ice oreo: two layers of ice cookie with a creamy snow middle. Yum. 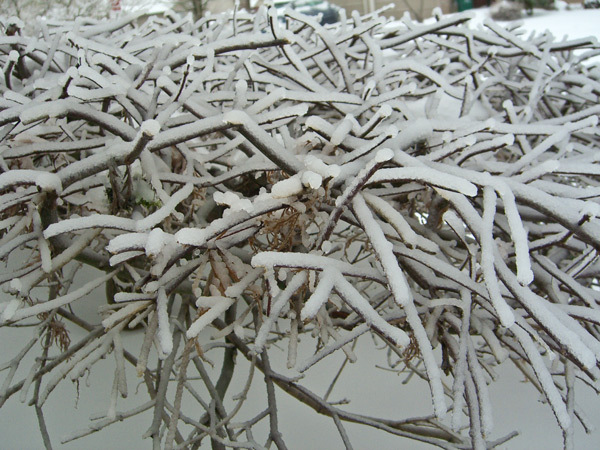 This is the ice on my Japanese maple. I have to admit that, while I really hate ice storms, if I’m warm and safe I love the way that the ice looks as it coats everything. I wish we had sunshine today, because that’s when it’s really lovely. I have lived in the Portland area for 35 years, and I don’t ever remember having snow like this. I wonder if my camellia will bloom this year? It was budding nicely when all of this hit. And now it’s frozen in time. You know how I said a few days ago that Barry The Berry Bear should be hibernating? Bet he wished he’d listed to me. My ever helpful spam-banisher is marking some of the contest entry comments as spam – probably because of the lists of numbered items. Don’t worry because it never banishes any comments so far away that I can’t retrieve them. If your comment doesn’t show up right away, please just wait a few hours and then check back. I’ll try to get on periodically during the day to check for any comments that have been spaminated. Of course, if your comment hasn’t shown up by, say, 10:00 PM on Sunday, shoot me an email. I’ll consider emails received before midnight to be valid contest entries in any case where the comments don’t work. If you have both commented and emailed, I’ll consider your comment to be the “official” entry. Yesterday was an interesting day, gentle reader. First, thank you to everyone who clicked through to Jack Bog’s Blog for Buck-A-Hit Day. $9,920 was raised for very deserving local groups. Thank you, thank you! I’m really sorry to anyone using IE who started getting can’t load this site messages. I know it was awhile before I noticed. There were some things not playing well together. I got out all of the tools at my disposal and fixed it as fast as I could. You might have also noticed a few things coming and going, appearing and disappearing. That was caused by the need to upgrade a few plugins that I thought were OK. It should all be back in place now. I think it’s done. If you find anything that’s broken, please let me know. Because of all of that, I think it’s time for a contest. I haven’t had one for a really long time, and I’ve been meaning to. And now it’s the holidays and I’m snowed in and all. So it’s time. 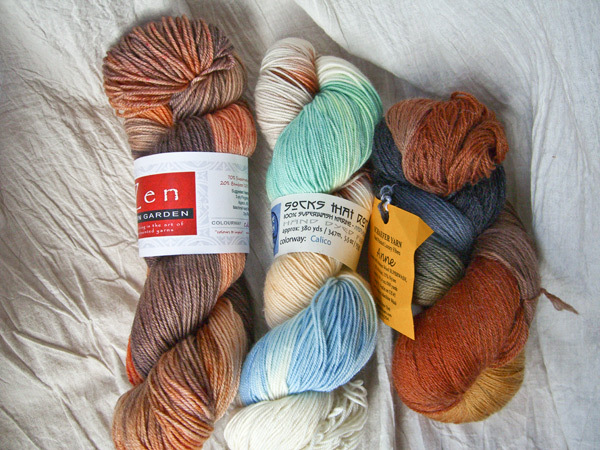 I have three skeins of yarn to give away, so that means I will have three lucky winners. Left-to-right, Zen Yarn Garden Bamboolicious in Creamsicle; Blue Moon Socks That Rock Medium in Calico; Schaefer Anne in Toni Morrison. I’d forgotten all about that Calico when I was searching for yarn to make fingerless gloves from. My forgetfulness will be your gain! Here’s the contest: the first picture in this post is a bunch of tools. Name all of them – every single one – in the comments. I will draw from amongst those who name all of them to select the winner. If nobody names all, I will draw from those who have the most correct. Be sure to click on the picture to see the biggie size. The rules: Tell me how many tools there are and name them. You can’t say something like a collection of widgets of varying sizes. You may say 9 widgets of various sizes. 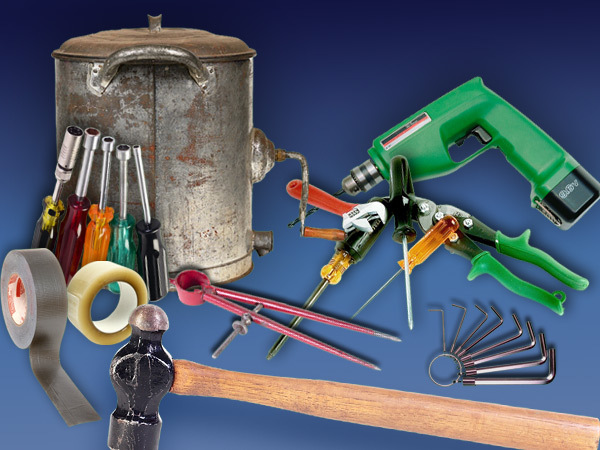 All of the tools are in plain sight – none are hidden. There’s one there that may be obscure. But why should I make this too easy? Contest will close Sunday night at midnight Pacific Time. Decision of the judge (that would be this intrepid reporter) are final. Blah, blah, blah.